← Where Was Jesus Coming From? Did Jesus Ever Make Mistakes? Of course, Jesus didn’t make any moral mistakes or sins. But being fully human, he necessarily had incomplete knowledge of the world around him. Certainly as a child, Jesus had to learn how to do some things. Even as an adult, he sometimes seemed unaware of things until informed by others. This inevitably led to mistakes of the factual error variety. Consider the story of the rich young ruler in Mark 10 and the parable of the mustard seed as examples. The young ruler walks away from Jesus without choosing to follow him, and Jesus says a mustard seed is “the smallest of all seeds on earth”. Botanically speaking, this simply isn’t true. 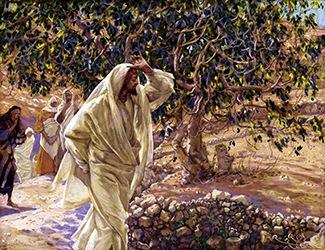 There is also the story (Mark 11:13) of when Jesus went looking for figs long before their season. An all-knowing person would not have done that. But if he was God, wasn’t he all-knowing? Luke 2:52 says Jesus grew in ‘wisdom.’ How could one who is completely omniscient learn or increase in wisdom or knowledge? Yes, he was God and in becoming man he never ceased to be divine. But when he “emptied himself by taking the form of a servant” and “being found in the likeness of men” (Phil. 2:7-8) he voluntarily suspended the use of those divine attributes that would have made it impossible for him to live a genuinely human life. In other words, the Son chose to experience the world through the limitations imposed by human consciousness and an authentic human nature. The attributes of omnipotence, omnipresence, and omniscience were not lost, but simply became latent within the confines of his human nature. They were fully present in Jesus but no longer in use. The incarnation thus means that Jesus actually thought and acted strictly within the limitations of a normally developing human person. He was human, warts and all and we know that to err is human. We also know that Jesus had a genuine human soul. His soul was “overwhelmed with sorrow to the point of death” (Matt. 26:38); it was to the divine purpose that he subjected his will (Luke 22:42), and it was into the Father’s hands that he committed his spirit (Luke 23:46). This entry was posted in Jesus, Ponderings and tagged God, Jesus, Luke, Mark, nature. Bookmark the permalink. This kind of renunciation, in fact, has often been the strength, born of necessity, of the world's disinherited, of those who do not fit in with their surroundings or with their own body or with their own race or tradition and who hope, by means of renunciation, to assure for themselves a future world where, to use a Nietzschean expression, the inversion of all values will occur. Kurtis Karr's Blog > Christianity > Jesus > Did Jesus Ever Make Mistakes?